One of the closest friends and family members you will have in your life is your brother or your sister. Celebrate this life long bond with a tattoo! A tattoo can be a permanent and stylish way to show the world that you have the best sibling and that you care. 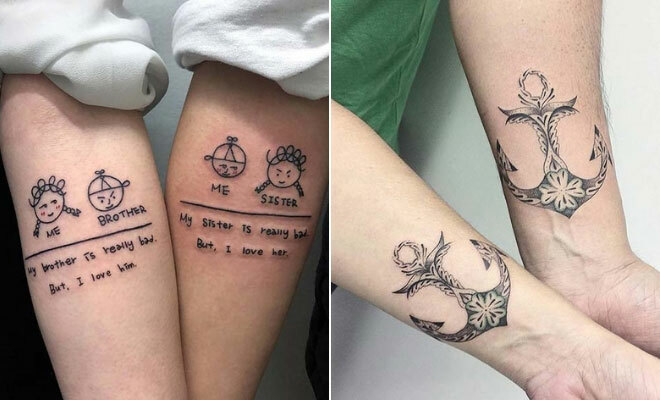 To give you some inspiration, we have found 23 awesome brother and sister tattoos so you don’t have to. You will find funny designs, portraits, tattoos with themes and more. The first set of tattoos we would like to show you are these matching anchor designs. An anchor tattoo can represent many things but commonly these designs symbolize stability, strength, strong bonds and relationships. 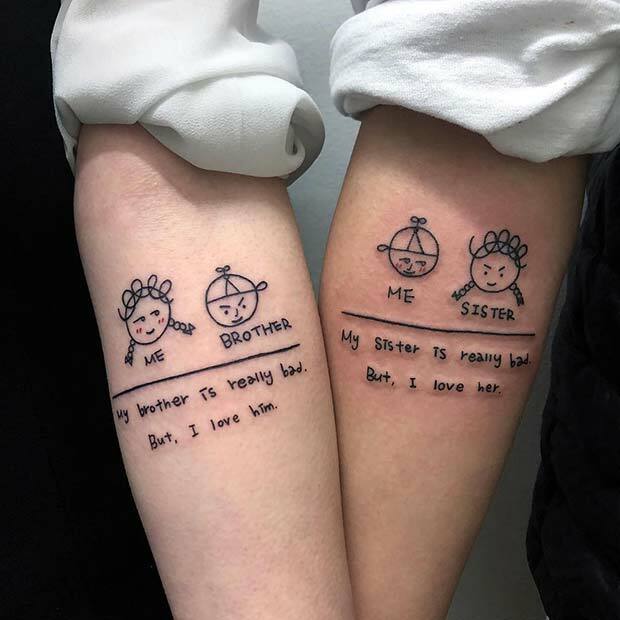 That is why this kind of tattoo is perfect for a brother and sister. It shows that you will also be there for each other and you can always rely on each other. 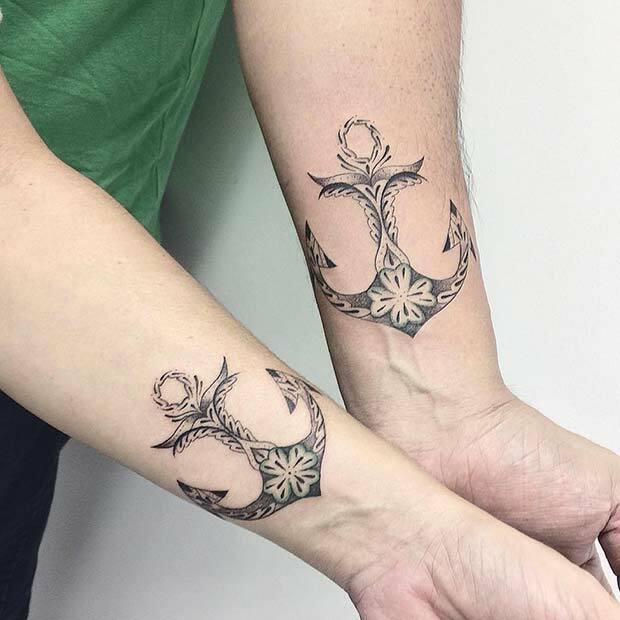 Choose a matching design like this or two different anchors. Many of you will have adorable photos of when you and your sibling were younger. Well, you can turn these pictures into a tattoo! 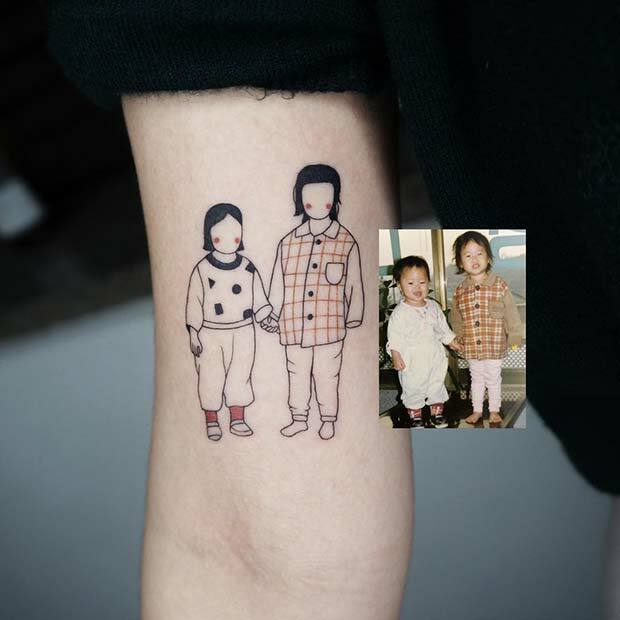 Here we have a cute portrait that has been turned into a trendy and artistic tattoo design. This is such a unique and awesome brother and sister tattoo idea. You can choose any picture you like, but try to choose one of a special day. Next, we have a super cute animal tattoo idea. 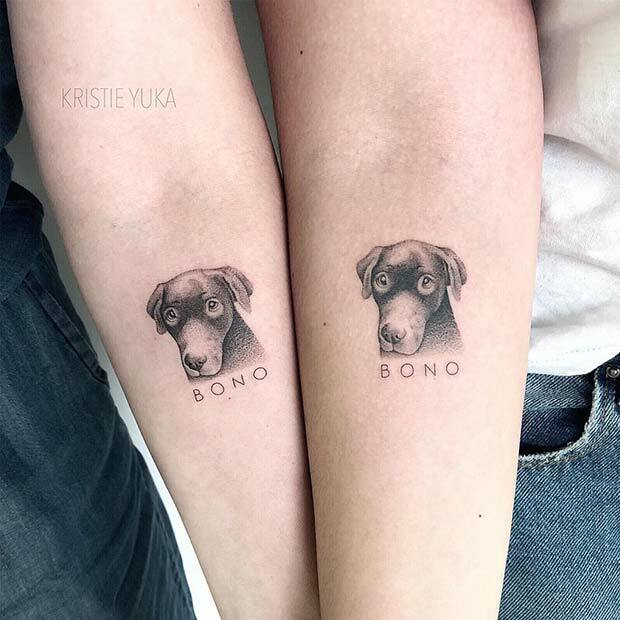 Here we have matching dog tattoos with a name underneath. You can recreate a design like this one as a memorial to you and your sibling’s childhood dog or just to celebrate your current one. You can have any pet created! If you want a brother and sister tattoo that isn’t too obvious then this design could be perfect for you. This idea features two triangles, one on each person. One of the triangles has just an outline and the other is colored in. This is a trendy idea where the two tattoos are connected through the design, but they will also look awesome as individual tattoos too. You can have any shape created in any color. Are you both fans of Harry Potter? Then this tattoo is a must-have. 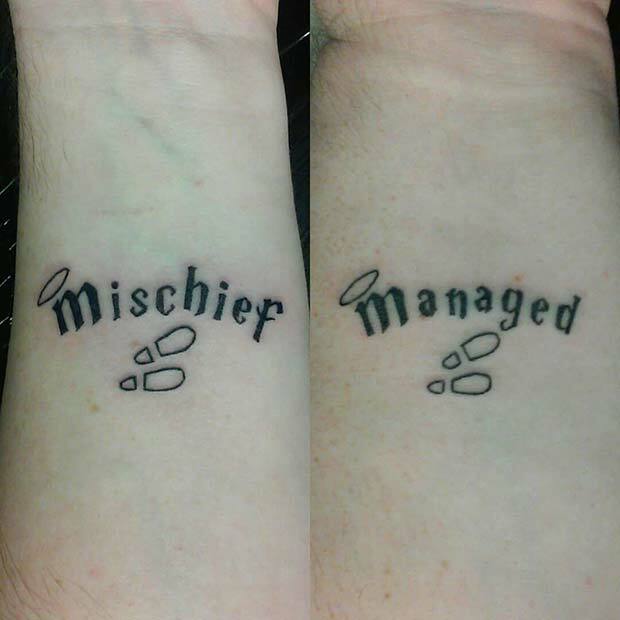 One has the word mischief tattooed on their wrist and the other has managed. This is such a cool and creative idea inspired by The Marauder’s Map that many of you will know. We love this design, it is one of our favorites! You can recreate this or use any other film or movie you both enjoy. Our next tattoo idea is for the travelers of the world. Here we have two compass tattoos. A compass is another design that can mean many things, but generally a compass symbolizes finding your way and not getting lost. This is perfect for siblings that are apart as it can represent how you will always find your way back to each other no matter the distance, and you will always find your way home. 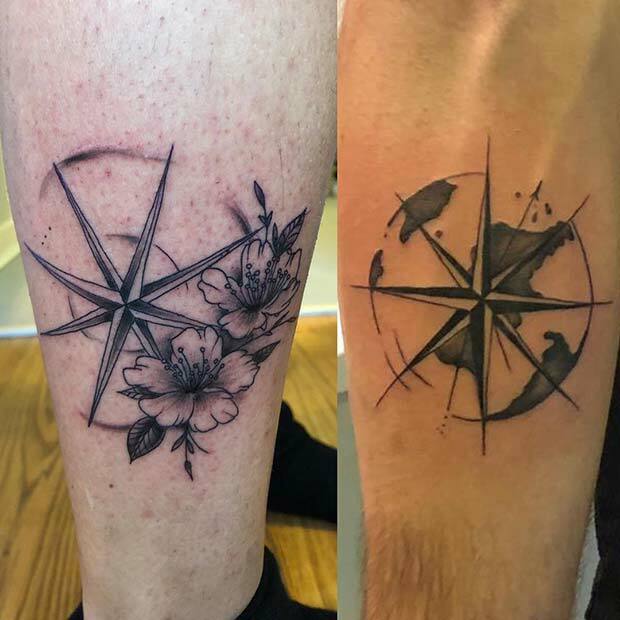 One compass has the earth as a background and the other has flowers, you can recreate these or design your own. Next, we have a unique tattoo idea to show you. 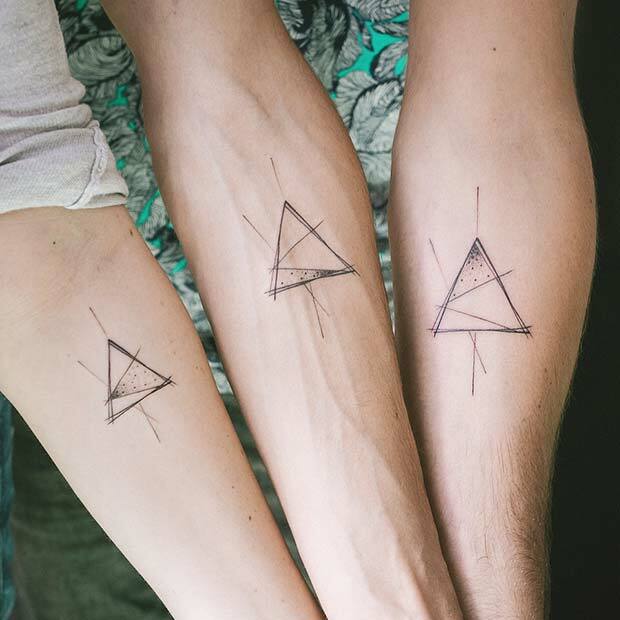 These siblings all have a triangle tattoo. Each triangle is separated into three sections and each one has a pattern in a different section. The different sections represent the order they were born. So, the first born has the first section colored and so on. This is such a creative and unusual idea. You can try a design like this with any shape and with any amount of sections for the number of brothers and sisters. Are you and your sibling always playing video games? Then this is the brother and sister tattoo for you! 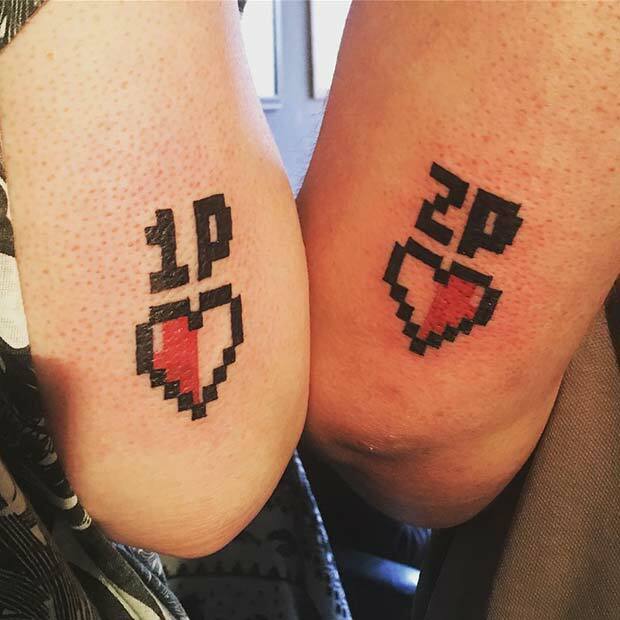 These two have chosen to have a heart and one tattoo reads 1P and the other reads 2P. This represents the number of players in the game. So, the first born can be player 1 one and so on. It is a fun and unique idea! 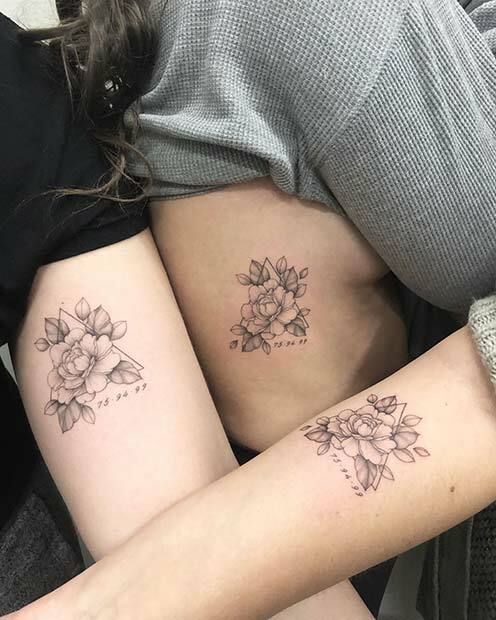 Another cool idea we have to share are these beautiful matching floral tattoos. These siblings have chosen to have a matching tattoo with a date underneath. The date can be anything you like – from a special day you want to remember together to dates of birth. You can also pair the date with any pattern you like. 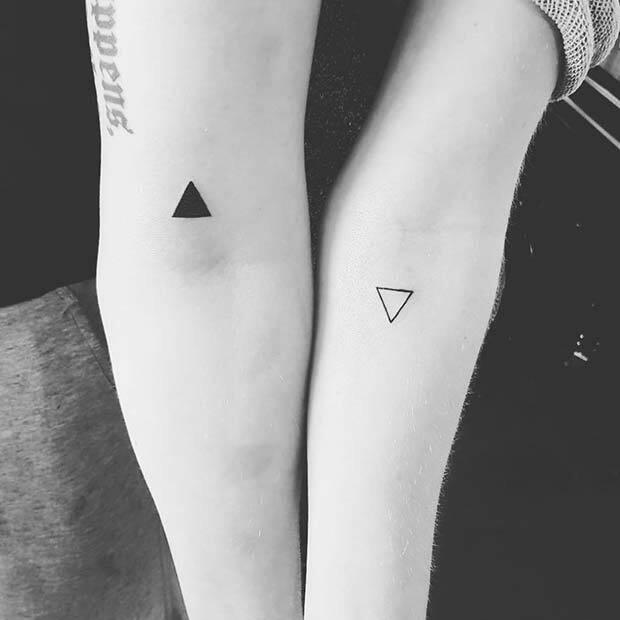 These tattoos are a great example because they are geometric, trendy and will suit everyone. Our next idea is for the brothers and sisters who like to joke and have fun. The tattoos have a similar design but they both state that the other one is bad but they love them anyway. This is a cool tattoo for the siblings that are competitive and those that argue about who is the best. It is a unique idea and it will make everyone laugh. Have you created more sister’s words, pretty picture because the oldest graduated in 1978 and myself (Gail) graduated in 1981. Our birthdays are in May 2 days apart here’s 25 mine 27th. We want to make them personal..I Gail has raised 3 boys.. I have one grandson that is 13. The oldest sister raised 1 boy and a girl.. I just hope that you can draw somthing out with all the information that I’ve giving you! One last question where are you located ? We sure hope and pray that your near!! If not would you referre us that you believe in to get what we want?